1. a pin tapered at one end or both ends, or something with this shape. 2. the thin, tapering figure occurring during metaphase of cell division, composed of microtubules radiating from the centrioles and connecting to the chromosomes at their centromeres. Called also mitotic spindle. mitotic spindle spindle (def. 2). muscle spindle a mechanoreceptor found between the skeletal muscle fibers; the muscle spindles are arranged in parallel with muscle fibers, and respond to passive stretch of the muscle but cease to discharge if the muscle contracts isotonically, thus signaling muscle length. The muscle spindle is the receptor responsible for the stretch or myotatic reflex. sleep s's bursts of activity of a particular waveform in the electroencephalogram in light or early sleep. A sensory receptor in a muscle that responds to the stretching of tissue. Also called stretch receptor. a specialized proprioceptive sensory organ composed of a bundle of fine striated intrafusal muscle fibers innervated by gamma nerve fibers. Their nuclei are gathered together near the center of each fiber to form a nuclear sac, which is surrounded in turn by sensory, annulospiral nerve endings, all enclosed in a fibrous sheath. a PROPRIOCEPTOR found in skeletal muscle in the form of a capsule containing specialized muscle cells and nerve endings. 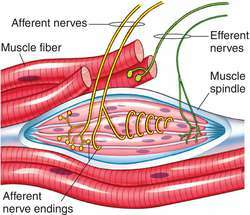 Change in length or tension of muscle cells stimulates the spindle. 1. mitotic spindle; the fusiform figure occurring during metaphase of cell division, composed of microtubules radiating from the centrioles and connecting to the chromosomes at their centromeres. a mechanoreceptor found within a skeletal muscle; the muscle spindles are arranged in parallel with muscle fibers. They contain three to 10 small, striated muscle fibers (intrafusal fibers) contained within a capsule and supplied with specialized motor and sensory nerves. They respond to passive stretch of the muscle but cease to discharge if the muscle contracts isotonically, thus signalling muscle length. The muscle spindle is the receptor responsible for the stretch or myotatic reflex.